The cantilever rear panel opened to reveal the Leclanché battery pack. Bruges and double articulated Exqui.Citys in Kortrijk itself. As an international tourist destination with narrow streets in its World Heritage city centre, Bruges has for many years benefited from operations tailored to its needs by De Lijn, the bus operator in the Flemish part of Belgium. The city services have seen several generations of midibuses, usually supplied by Van Hool from its A300 range, the latest being five hybrid newA308s delivered from 2009. 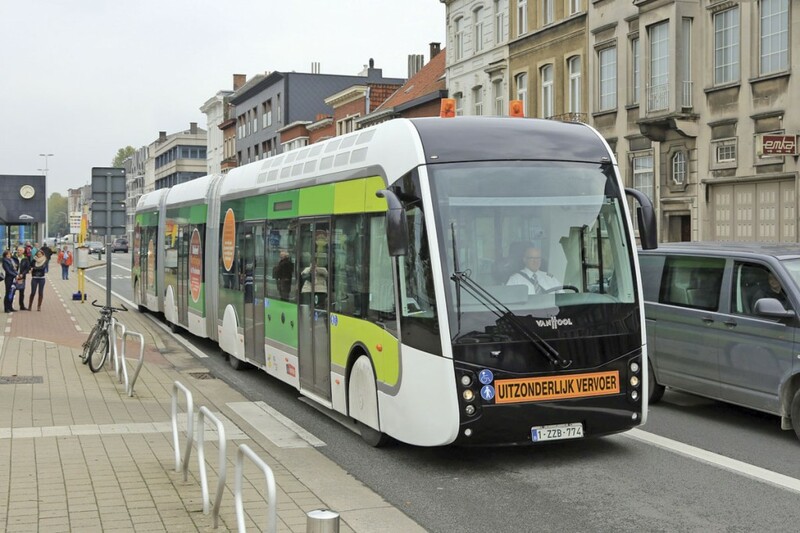 The Saturday of Busworld marked the launch of the next milestone for Bruges city services with the unveiling of the first wirelessly charged electric bus system in Belgium. 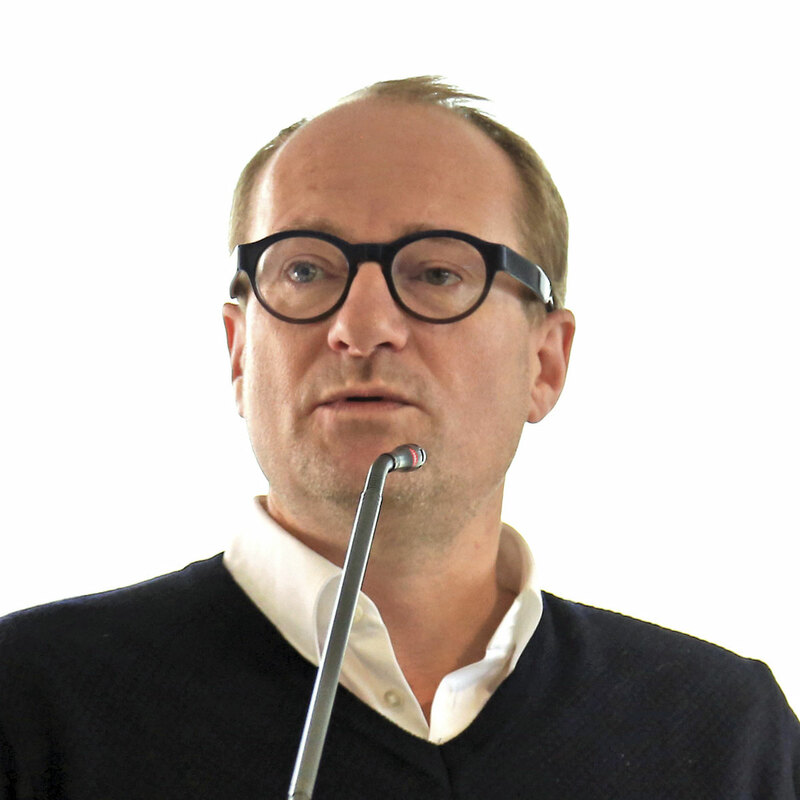 Following transfer by a Van Hool coach from Busworld, members of the trade press joined the local and national Belgian press in De Lijn’s Bruges depot for an address from the Flemish Minister of Mobility, Ben Weyts. The Bruges buses are part of the Flemish government’s R&D project, EVTecLab, which allows transport companies to gain experience with pre-commercial vehicles developed by Flemish companies. The €4.5 million project also encompasses twenty vans, two lorries and a fuel cell bus. €1.5 million has been allocated to delivering the Bruges buses and their associated infrastructure. 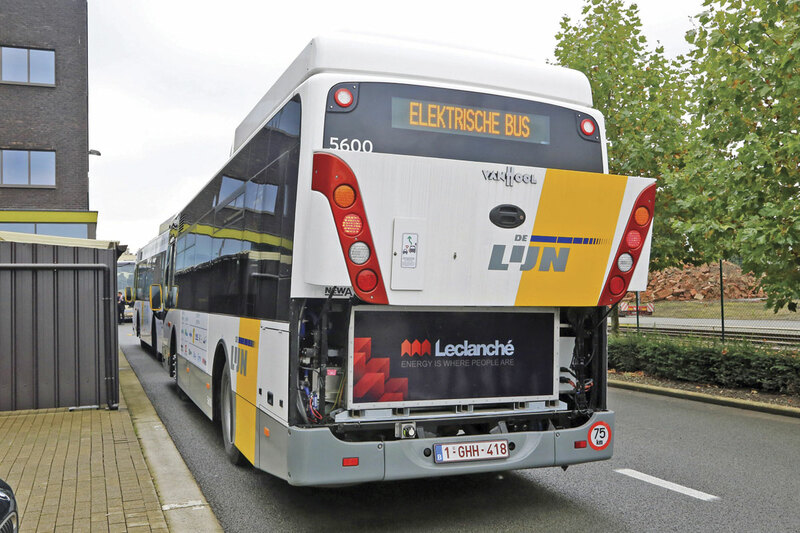 In addition to Van Hool, the project partner’s include Bombardier for their PRIMOVE charging technology and battery supplier Leclanché together with technical and scientific support from Flanders Make, iMinds and Brussels University. The TX16 Astron for a French customer used for the transfer to Bruges. Three PRIMOVE charging stations have been installed in a compound adjacent to De Lijn’s Bruges depot. These are a short distance from the electric bus route’s terminal at Bruges station which also services a large park and ride site. The route follows a 3.2km (including return) journey from the station to t’Zand square in the city centre where the island bus station is circuited clockwise. Free of any significant obstacles other than traffic congestion, the route operates at frequent intervals taking 10 to 15 minutes. Two of the buses are expected to be in service during the week, reducing to one on Saturdays. Opportunity charging by reversing the vehicle into one of the kerbed PRIMOVE bays and deploying the pick up coil will take place after a number of circuits. The fixed charging slabs of the PRIMOVE system are buried meaning the bays have a continuous surface. Charging takes place after the system has checked that there are no obstructions between the slab and the pick up, the slab only being live when it is fully covered by the vehicle which should be fully charged within 12 minutes. The launch was introduced by De Lijn’s local director, Suzy Costers, and afterwards she gave some further information on the recent growth of the operation in Bruges. In ten years, passenger numbers have grown from 1.2m journeys annually to 10m, much of it short distance traffic within the city. The €1 flat fare, subsidised by the city, on the service between the station and the city centre has been a key element in this growth. This frequent midibus service also carries significant numbers from the park and ride site where the parking charge of €3.50 includes free bus transfer for up to four passengers. The city also hosts ‘shopping days’ with free bus travel. The pick up coil can just be discerned deployed over the charging slab in one of the kerbed bays. 135 mainly Van Hool buses are based at the Bruges depot, ranging from the A308 midibuses to Euro VI NewAG300 artics. The larger vehicles are predominantly deployed on interurban and school services, the latter being another area of significant growth. The depot is also home to a De Lijn PCV driving school complete with a dedicated training compound where a variety of manoeuvres can be practised. 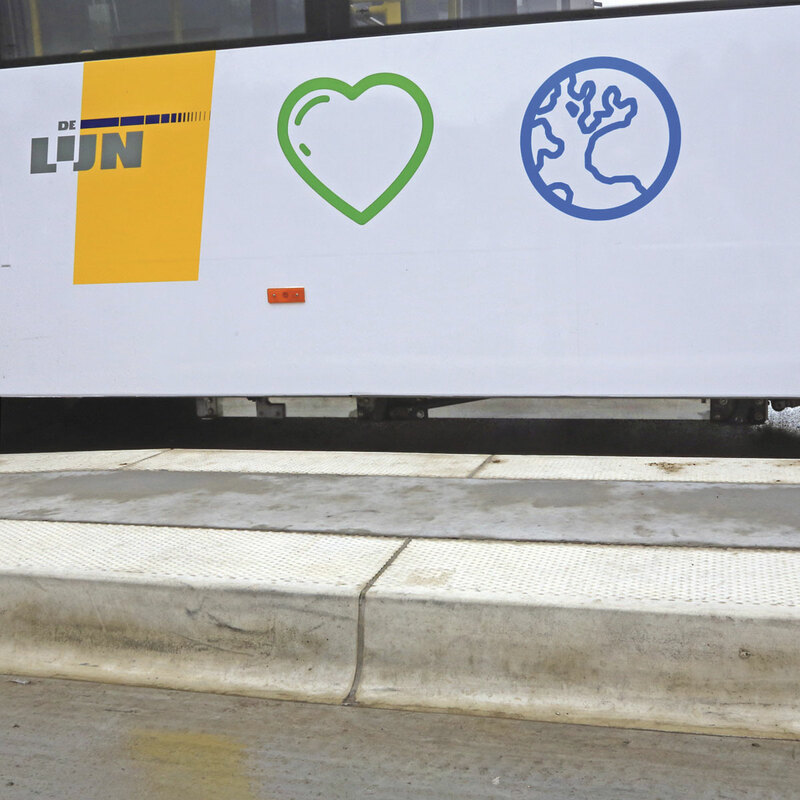 The electric midibus was demonstrated here after the launch, the driver showing both its very rapid acceleration and his ability to bring it to stop at the required point without using the conventional brakes, significantly reducing component wear. Transfer from Busworld to the launch was courtesy of a high specification 13.2m Van Hool TX16 Astron destined for a customer in France. 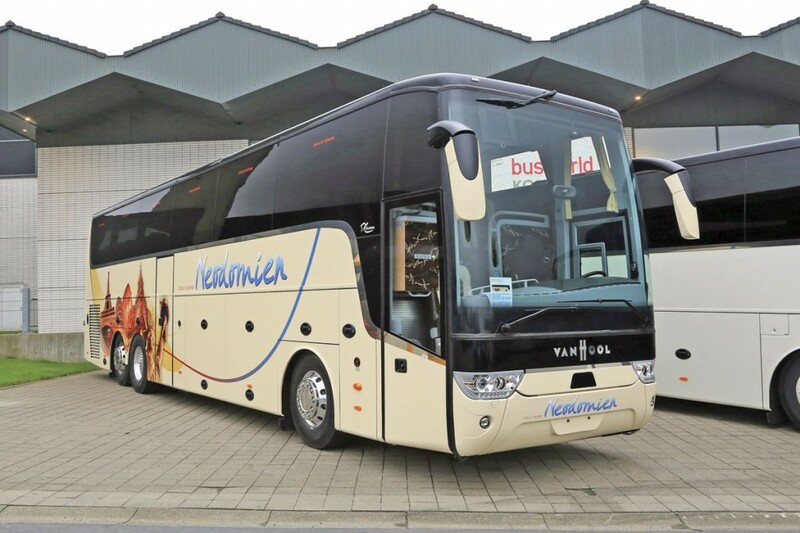 It featured 55 TX Grand Luxe reclining seats with two point belts, glazed roof panels, a toilet and a Tesia multimedia system with three 19 inch screens. Comfortable cruising at Belgium’s motorway speed limit was assured by the specification of the 462hp version of Paccar/DAF’s MX13 engine coupled to ZF AS-Tronic transmission. To meet French regulations for carrying children, it was equipped with an Alcolock device and school bus signs. An Exqui.City departs from the rear of Kortrijk Station bound for VOKA. 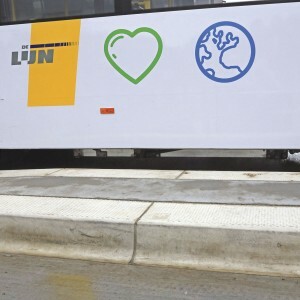 For a two week period spanning Busworld, De Lijn operated a free 30 minute frequency service from the rear entrance of Kortrijk railway station to VOKA, the West Flanders Chamber of Commerce situated immediately beyond Kortrijk Messe. In peak hours, the service frequency increased to every 15 minutes with the route diverted to serve the University. The eight sponsors of the service included Busworld and the City of Kortrijk. Passengers were asked to complete a questionnaire designed to help shape the future format of bus services along the corridor. At the end of the trial, one lucky winner was to be drawn from all the completed questionnaires and receive a holiday for two in Martinique. Two Van Hool Exqui.Citys were used for the trial, similar to vehicles currently being delivered to Martinique. The diesel electric three section hybrid articulated buses are 24m long with four axles and a low floor throughout. Although there are no significant geographical challenges in the Kortrijk area, the non elevated location of the railway effectively divides the city in two from a public transport perspective. Buses from the direction of the Messe have to turn and run parallel with the railway before reaching the rear entrance of the station, the turns involved are tight but the steering axle on the rear section ensured the Exqui.Citys took them without problem.